Apple's iPhone is king of the mobile world, according to reports from two different metrics firms. The Global Intelligence Alliance Group (GIA) released a report recently that says the iPhone has the leading app store for mobile devices, while Net Applications says Apple's Safari is the most popular web browser among mobile device users. The data indicate that Apple not only leads the market place on both counts, but its main competitors lag way behind the iPhone. 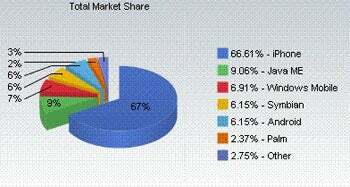 The numbers from Net Applications' analysis of mobile web use for February 2009 gives the iPhone a gigantic slice of the mobile web browsing world with 66.61 percent. Following Apple at a distant second are browsers based on Java's ME application platform with a mere 9.06 percent, and Windows Mobile takes the bronze at 6.91 percent. Rounding out the top five are Symbian, found primarily on Nokia handsets at the moment; and Google's Android. Research In Motion's Blackberry devices rank seventh taking only 2.24 percent of mobile web browsing activity. GIA's report, on the other hand, is not as clear cut since the analysts wanted to determine which company or platform produced the best application store for mobile devices. The study analyzed application stores from six different retailers including Apple, Nokia, Google, Microsoft, Research in Motion (aka Blackberry), and Palm. The app stores were judged on five categories: when the app store opened in comparison to its competitors (time to market); capability to attract developers to create apps for the device; success of roll-out and sales of a given brand (rate of device adoption); efficient interface and user experience at the app store; and the number, variety and appeal of apps offered for sale. GIA gave a maximum of two points for each category with ten possible points overall. According to GIA, Apple scored nine points, followed by Google and Nokia in second place with seven points apiece. Windows came next with a score of six, and RIM and Palm rounded out the list with scores of five and three points respectively. GIA says Apple's success is due to its ground-shaking concept that a smart phone is not just a piece of hardware with a bunch of features, but a software platform that embraces third-party applications developed from both corporations and start-ups. Apple was also one of the first and most popular app stores to launch, and the fact that people were already accustomed to making purchases through iTunes made it easier for iPhone users to figure out the iPhone App Store. While I don't dispute Apple's success as characterized by GIA, it seems to me that this report is a little problematic. In fact, I don't think it gives a clear picture of the current mobile world. We have to bear in mind the mobile phone industry is in a huge state of flux. This is due largely to the introduction of the iPhone, which significantly opened up the smartphone market to non-business users and reshaped the smartphone's potential. Since then every company has tried to come out with an "iPhone killer," and adapt the iPhone-App Store ecosystem to its own business model. GIA's analysis doesn't seem to account for this flux. If you look at GIA's scores, for example, a company gets a zero if there isn't any data for that category. So Nokia, RIM and Palm get a zero for "number, variety and appeal of apps." That score is not entirely surprising since both Nokia and RIM haven't even opened their app stores yet, and Palm's relevance in each category will certainly change after the company releases its own "iPhone killer," the Palm Pre. In fact, when you look at the scoring, Apple is the only company that didn't receive a zero in at least one category. That's because Apple already has its pieces in play for each category, while the others are either trying to consolidate a wide range of products or are in the middle of launching their devices and/or app stores. It seems to me that GIA came out with this report too soon, and if the researchers revisit the situation in a year, the numbers will be significantly different. Most likely Apple will still be on top, but some of the other competitors will probably change places and perhaps even score closer to Apple. GIA's report gives some food for thought, but I'd rather see the analysts revisit their study once all the companies mentioned have their app stores on the market.